We’re kicking off annual our #choice4xmas campaign. Here's a quick guide on how to take part. Last year, we launched our first ever #choice4xmas campaign, encouraging Irish expats to ‘check-in’ during their travels home to Ireland to show solidarity with the 11 women a day who have to travel in the other direction for safe and legal abortions. Hundreds of you took part, sharing pictures and social media posts at airports and ferry ports around the world. We also asked you to strike up conversations about abortion rights with family members and friends over the Christmas period. This year, we want even more people to get involved. Together we can send a message to governments in Ireland and Northern Ireland, that we will no longer stand for the exportation of women to Britain and elsewhere for basic healthcare. Oh, you want me to talk to my family. any tips? The first step in taking part in #choice4xmas is to equip yourself with the right skills and information to talk to family and friends about abortion rights. We know it's a tricky subject and not everyone will feel comfortable bringing it up at the dinner table. But frank and open conversations about reproductive rights are exactly what we need right now, especially ahead of the Repeal referendum in the Republic of Ireland. Over the next week, we'll be sharing helpful information and conversation starters on our social media platforms, that will make it easier to strike up those much needed chats. We'll also be running workshops, which will prepare you to discuss abortion openly and confidently and help to win some votes over Christmas. One takes place on Monday 10th December and another on Sunday 17th. How do I get involved on social media? Last year's mass social media campaign was a huge success, receiving national press coverage in Britain and Ireland. This year we want even more people to get involved. 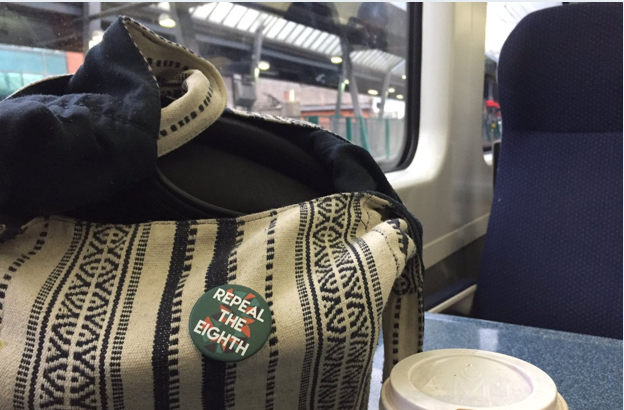 We're asking each of you travelling home to Ireland to 'check in' at train stations, airports or ferry port, with a post showing solidarity with the 11 women a day, who will be going in the other direction over Christmas. This can be using pictures, videos or just words. Whatever you're most comfortable with. You can tag us on Instagram, Facebook or Twitter. By flooding people's timelines with messages and imagery, we can make sure the women leaving Ireland in search of basic healthcare are not forgotten over Christmas. Can I raise money too? Yes you can. As well as tagging your travels you can tag your luggage too. Our "Healthcare not Airfare" tags cost £3 each and are available on Etsy*. They make the perfect pro-choice stocking filler, with all proceeds going to Terminations for Medical Reasons (TFMR). *Our first batch of tags have sold out. But more coming soon. We'll also be hosting the fantastic winner of Best Production of the Dublin Fringe 2017, NOT AT HOME in London. It's an art installation with sound and video and live performance, which aims to make visible the experience of Irish women who have travelled abroad to access safe abortion services. It's free to attend but you can donate once you're there. The artists hope their London residence will help them raise enough money to bring the exhibition to every county in Ireland. It takes place at Platform Southwark, SE1 8BS on December 16th and 17th. More details here. Christmas is a time for fun though. I don't want bring down the mood. Yes, Christmas is a wonderful time of year when those who have emigrated come back home to celebrate with their family and friends. But it's also an opportunity to have much needed discussions and raise awareness of a topic that's close to our hearts. While the rest of us are celebrating, many women will be travelling to Britain feeling exiled and alone. For them, there is no welcome at the gates, no smiling faces or reassuring hugs. We want to make sure they are not forgotten. We hope this will be our last ever #choice4xmas campaign. We want free, safe and legal abortion across the island of Ireland. And we need your help to make it happen.